"You smell that?" asks Tommy Bolack as he sparks a transformer in his electromechanical museum. IT&apos;S A WONDER Tommy Bolack isn’t deaf. He’s a thump junkie, he told me over the phone. He likes things that go boom. He also said that he volunteers to transport prisoners for the sheriff’s office and spins vinyl 45s in his living room for a Sunday afternoon radio show. The man has a variety of interests—electricity, law enforcement, ranching, wildlife, cultural anthropology—but pyrotechnics is by far the loudest. His pyro ardor culminates annually on the Fourth of July. From the bluffs of his family ranch, a 12,000-acre spread abutting the Farmington city limits on the south, he detonates about 750 pounds of explosive material in 500 large shots and about 2,000 smaller ones. Steel launching tubes—some taller than a man, at least one that’s 16 inches in diameter—are lined up like the pipes of a giant buried organ. Bolack hides behind a semicircular steel shield that, he says, blocks most of the shockwaves. I ask him if he wears ear protection. Bolack has a Class B explosives license from the Bureau of Alcohol, Tobacco, and Firearms. Which means that he can buy some highly incendiary stuff, including dynamite, from places like Nevada, Wyoming, and China. Part of having the license means that the ATF inspects his Type 4 magazine, where the explosives are stored, every five years. The magazine, an eight-foot steel cube, sits heavily and diminutively alone on a pile of rocks, apart from the other ranch buildings. Its only notable features are four welded hinges and two large locks on the door. On a cold fall afternoon, Bolack heaves open the door with obvious caution. “There’s enough explosive material in here to blow us all to kingdom come,” he says. The magazine is filled with cardboard boxes that are filled with explosives. There’s very little metal in the room to avoid any sparks from static electricity. Fireworks materials come in a variety of forms: small gray balls the size of marbles, paper-covered spheres as big as melons, fine and coarse powders. Bolack runs some of the fine powder into an empty plastic canister, pours in a handful of small balls, and grabs a coil of fuse. From the passenger seat, I see the fuse take off. We drive quickly across the pasture. We see the flare first, a bright pink-and-orange flash that reflects off the cliff line for several hundred yards. Then the report comes in two stages, the first like the crack of an elk rifle, the second like the heavy thud of an artillery shell. Bolack smiles. “Boom,” he says with a chuckle. TOMMY BOLACK WAS BORN Winfield, Kansas, in 1951. His father, Tom, brought the family west to prospect for oil. He found it in the San Juan Basin and, through a series of land purchases beginning in 1957, put together the B-Square Ranch. Tommy has lived on the ranch nearly his entire life and continues to run it. In some ways, the ranch is a typical cattle operation for northwestern New Mexico. Its 400 mother cows graze the high country near Mancos, Colorado, in the summer, come home to the ranch in the winter, and are part of a seasonal pasture rotation in the meadow bottomlands along the San Juan. He tells me this as we look over one of his meadows, where half a dozen deer are grazing. Bolack is a big man, better than six feet tall and broad across the shoulders. With his hands on his hips and his bald head bared to the morning sun, he surveys his ranching operation with noticeable pride. He’s not your typical rancher, though, and the ranch is anything but ordinary. Technically the place is called the B-Square Ranch and Experimental Farm. Driving in the front gate, the first thing that might tip you off to the place being abnormal would be the cassowaries—emu-like birds with deadly poison claws—strutting through the sagebrush to the left. Peacocks sit on the rail fence that leads to the old ranch house that’s now the Bolack Fish and Wildlife Museum. Behind the museum is a 70-acre lake, one of seven on the ranch, teeming with several hundred ducks and geese. A pile of corncobs 15 feet high, as big as a minibus, sits nearby. Bolack has a waterfowl propagation permit with the U.S. Fish and Wildlife Service that allows him to feed about 150 tons of eared corn each year to the birds, and the B-Square Ranch is clearly on the migratory radar. After the cobs are picked clean, they’re composted, scattered on meadows, and plowed in as fertilizer, which returns nitrogen to the soil, he says. Beside the pile of corn, a large metal cage looks like it came out of a zoo. He tells me that it was home to a black bear he raised and kept for 36 years. As we drive around the edge of the lake, a gang of Río Grande wild turkeys trots into the dappled shade of cottonwood trees. The turkeys had been picking at a heap of rotten apples. The good apples from the ranch orchard go to the kitchen, the bad apples go to the turkeys. Bolack and his father are part of the reason the turkeys now live in the Farmington area. In the late 1950s, his father began a working relationship with New Mexico Game and Fish that started with reintroducing turkeys on the ranch. In the late nineties, Tommy raised 75 turkey hatchlings that he later released. He estimates that there are currently about 300 of the birds living on the ranch, and they’ve dispersed up and down the river valley. Most recently, he partnered with Game and Fish in a program that involved trapping deer in the Mount Taylor and Farmington areas and exchanging the animals between habitats to increase genetic diversity of the herds. His father often worked with Game and Fish to carry out wildlife management programs. He was also politically involved. He served as mayor of Farmington from 1952 to 1954, as lieutenant governor of New Mexico under Edwin Mechem—and acting governor for 23 days when Mechem vacated the office—and for one term in the New Mexico House of Representatives. Tom, who died in 1998, was also an avid sportsman, traveling the world to hunt and fish for an impressive array of animals. Many of those animals—more than 4,000, in fact—are now mounted in the Bolack Fish and Wildlife Museum. The animals are organized by habitat in dioramas representing environments on five continents, from Canada’s alpine tundra to the savannas of East Africa. The museum is open by appointment and is a frequent stop for buses of schoolkids. Last May, 932 students came through the museum, says my tour guide. IN 1980, Bolack paid $1,000 for a behemoth steel railroad bridge that was built in 1899. For another $74,000 he had it driven down the highway from nearby Flora Vista by semi trucks and craned into place over the San Juan River, thereby connecting the north and south portions of the ranch. As you rattle across the bridge, the first thing you notice is an old water tower, standing like a spaceship over an antique locomotive, a DC-3 airplane, large assemblages of power plant gear, and the three spacious buildings of the museum complex—more than 50 years’ worth of Tommy’s pack-ratting. Walking through the door of the museum is like entering Mr. Wilson’s cabinet of old electrical stuff. The place is crammed full—and tightly organized—with equipment and devices that use, transmit, convert, or relay electricity. Generators, transformers, and a wall of switchgear from nine power plants greet visitors. An antique streetlamp, lit by an electrical arc between carbon electrodes, hangs from a utility pole. An X-ray machine from the early 1900s, found fully intact under an inch of dust in Roy, New Mexico, looks like a good way to get too much radiation. Bolack bought Albuquerque’s first generator and a control panel used at Navajo Dam, both now bolted to the museum floor. Nearly every object in the place is old, heavy, made of steel, and freshly painted. Beside and behind the main building of the museum, two other buildings hold similarly large Bolack-style collectibles. What he loosely calls the transpor-tation building houses, among other things, an F-5 fighter jet used to train pilots, a mint-condition Wells Fargo stagecoach, the massive cockpit of a World War II bomber, and Elvis’ last Cadillac, painted a luminescent gold and completed after his death. Forty or so kiosk voting machines from the Bush-Gore election sit in long lines arranged behind a terrifying display of antique medical equipment. 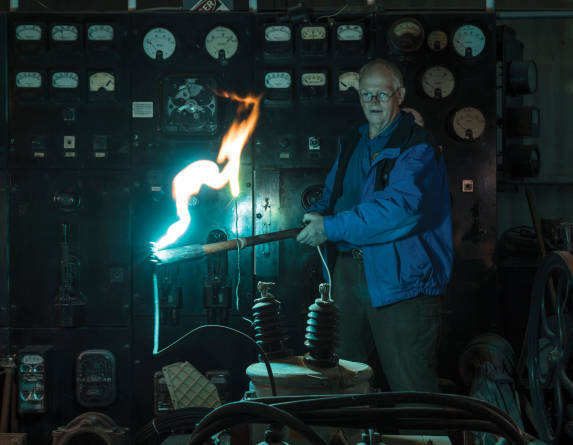 Though the electro-mechanical museum sees fewer visitors than the wildlife museum, electricity is Bolack’s passion. He visits schools to give a demonstration called “Electricity: The Silent One,” he tells me as he rolls out a large steel cart mounted on wheels. A barrel-shaped transformer, as seen at the tops of utility poles, is mounted in the middle of the cart. He plugs a heavy cord into a wall outlet and unrolls another cord with a handle and button on the end that breaks the current, 4,500 volts at six amps. BOLACK&apos;S FIRST LESSON in electricity came through a fork inserted into an electrical wall outlet, or a duplex receptor as he calls it, when he was four years old. Ever since, currents, volts, amps, generators, lightning arrestors, and circuit relays have fascinated him. He earned an electrical engineering degree from New Mexico State University and later, in the late eighties and early nineties, reengineered the nearby city of Aztec’s grid. He wired the ranch and its houses, outbuildings, and large irrigation pumps. The heap of 300,000 insulators in the yard is cool, Roberts says, but nowhere near as significant as what’s in Bolack’s private-private collection. “The really nice stuff, what he’s really curated for the hobby, is in his house,” he says. The house, built in 1984 on a low rise above his hay meadows, is made of rock and wood, and nearly all of the rocks are petrified wood from the B-Square Ranch; the other rocks are mostly dinosaur bones from the ranch. It stands two stories, tucked against a north-facing cliff line, and is surrounded by more petrified wood, heaps of insulators, and half a dozen Honda three-wheelers. In the driveway, a handful of old ranch trucks rest in peace where they bit the dust however long ago, parked on flat tires and quickly becoming artifacts of industrial art. Inside the heavy wooden doors emblazoned with a B in a square, a spiral staircase—with a three-inch radio transmission coaxial cable for a handrail—winds to the second story. The north side of the house is mostly glass. The first thing I notice is that there is less available shelf, floor, or wall space in his house than in the museum. Bolack displays his insulators in lighted glass cases mounted on walls and in front of windows and arranged among his other possessions—a frontier-era Gatling gun, a collection of fighter pilot helmets, and many gray, paper-like wasp nests, long abandoned by their makers and displayed on their original tree branches. Boxes of explosives are wedged under the desk where he spins the 45s for his Sunday radio show. A coil of fuse lies among salts used to color explosions. The insulators, though, seem to be his greatest source of pride. Bolack is what’s called a CD collector in insulator parlance, meaning that he wants one of every consolidated design, or, essentially, make and model. He has a model of one of the first insulators ever used, insulators used by Civil War communication teams, and insulators from the Transcontinental Telegraph Line. The racks and rows of Technicolor insulators, each with a story that Bolack’s quick to relate, speak to decades of commitment to the hobby. Being unfamiliar with insulator collecting or the value of rare insulators, I ask Roberts if Bolack has $100,000 worth of insulators in the collection. After hanging out with Bolack, listening to him speak in sci-fi vernacular about insulators and electricity, watching him toil with flame and smoke while holding a drop-dead switch, hearing about his totally robust management of the land and wildlife, and then touring his house, I feel myself callousing to the extraordinary. The man’s curiosity knows no bounds, and nothing he shows me next will surprise me. Then I take a photo of a book called Irradiation Effects on Structural Alloys for Nuclear Reactor Applications. When I look at the photo later, I notice that the book sat on a $200 million bill from the Reserve Bank of Zimbabwe. In fact, it sat on a large stack of Zimbabwean cash, easily several billion dollars in worthless currency. BOLACK IS NOT A COP, but he’s pretty close. His official title is volunteer special deputy for the San Juan County Sheriff’s Office. The day I meet him, he’s wearing a blue polo shirt with the sheriff’s office insignia and dark green slacks. His truck, a 2007 Ford pickup, is a former sheriff’s vehicle that belonged to a friend with the department. It has working sirens, light bar, dash cam, and radios. As we step out of the museum, Bolack’s equipment operator, who’s worked for him for the past 30 years or so, pulls up in a pickup truck. He’s a salty-looking man who could have just stepped out of a bulldozer. He tells Bolack that he saw the ranch trailer loaded with hay going down the highway. “Didn’t know if maybe you decided to get into the hay business,” he tells Bolack. Bolack seems to enjoy an air of authority. In addition to helping transport prisoners, he volunteers as a security guard in district court for the sheriff’s office. He’s ridden along with deputy sheriffs on 450 ten-hour patrol shifts, and he just surpassed 10,000 hours of volunteering for the sheriff’s office. He sees his service as a way to give back to the community. In many ways, Bolack has overlapped his personal interests with avenues of community service. He loves to detonate explosives and points to 35,000 people who watched his fireworks show last year. About 6,000 kids came through the museums last year, he says. From feeding the wildlife to working with San Juan College to excavate archaeological sites on the ranch, Bolack believes in returning the favor. He served on the board of the New Mexico Farm and Ranch Heritage Museum, and, as host of the NIA meeting in 2014, he paid for every cent of it, Roberts says. Bolack isn’t married and doesn’t have any children. He lives alone in the big house made of petrified wood, surrounded by the footprint of him and his father, which won’t soon be lost in the dust. Bolack has set up a trust and a foundation to maintain ranch operations for “a long, long, long time.” The ears of corn will be there for the ducks and geese, the apples piled in the shade for the turkeys, and the alfalfa fields unfenced for the deer. Bolack has plans to protect the land through a conservation easement that will ensure it looks the same for generations to come. In the draws and arroyos of the ranch, more than 300 small dams will continue to fight erosion long after Tommy’s ashes have been scattered over the ranch or shot into the sky in one of his fireworks, the same way his father’s ashes were cast to the sky 18 years ago. At 66, Bolack is as healthy as he’s ever been. He has plans for the future that reach far beyond feeding rotten apples to wild turkeys. For one, he says, this year’s fireworks display will be a blowout. “We’ll get you in the blast zone,” he says. I tell him to count on it. After we set off our bomb in the pasture, we prepare to part ways. The sun has long set, and the ranch is quiet and dark. Bolack seems to hang a bit, like he’d happily sit in the old sheriff’s truck talking for another hour. I thank him for his time and for not blowing us up, and he stresses the importance of getting the facts correct for my story. We shake hands, and the green-and-white sheriff’s truck disappears down the ranch road, headed for the river. As he’s driving away, it occurs to me that I should have asked him to grab a beer. It might have led to some normal conversation. Tommy Bolack’s Fourth of July fireworks display can be seen from almost anywhere in Farmington. For the best views, though, go for a high spot on the north side of town that overlooks the San Juan River. To arrange a tour of the Bolack Museum of Fish and Wildlife or the Bolack Electromechanical Museum, call (505) 325-4275.